VIJAY: "Sir, why are we bound like this? Why don't we see God?" egotism has covered everything like a veil. 'All troubles come to an end when the ego dies.' 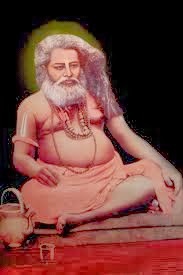 If by the grace of God a man but once realizes that he is not the doer, then he at once becomes a Jivanmukta. Though living in the body, he is liberated. He has nothing else to fear. "This maya, that is to say, the ego, is like a cloud. The sun cannot be seen on account of a thin patch of cloud; when that disappears one sees the sun. If by the grace of the guru one's ego vanishes, then one sees God. "Rama, who is God Himself, was only two and a half cubits ahead of Lakshmana. But Lakshmana couldn't see Him because Sita stood between them. Lakshmana may be compared to the jiva, and Sita to maya. Man cannot see God on account of the barrier of maya. Just look: I am creating a barrier in front of my face with this towel. Now you can't see me, even though I am so near. Likewise, God is the nearest of all, but we cannot see Him on account of this covering of maya. "The jiva is nothing but the embodiment of Satchidananda. But since maya, or ego, has created various upadhis, he has forgotten his real Self. "Each upadhi changes man's nature. If he wears a fine black-bordered cloth, you will at once find him humming Nidhu Babu's love-songs. Then playing-cards and a walking-stick follow. If even a sickly man puts on high boots, he begins to whistle and climbs the stairs like an Englishman, jumping from one step to another. If a man but holds a pen in his hand, he scribbles on any paper he can get hold of-such is the power of the pen! "Money is also a great upadhi. The possession of money makes such a difference in a man! He is no longer the same person. A brahmin used to frequent the temple garden. Outwardly he was very modest. One day I went to Konnagar with Hriday. No sooner did we get off the boat than we noticed the brahmin seated on the bank of the Ganges. We thought he had been enjoying the fresh air. Looking at us, he said: 'Hello there, priest! How do you do?' I marked his tone and said to Hriday: 'The man must have got some money. That's why he talks that way.' Hriday laughed. "A frog had a rupee, which he kept in his hole. One day an elephant was going over the hole, and the frog, coming out in a fit of anger, raised his foot, as if to kick the elephant, and said, 'How dare you walk over my head?' Such is the pride that money begets! "One can get rid of the ego after the attainment of Knowledge. On attaining Knowledge one goes into samādhi, and the ego disappears. But it is very difficult to obtain such Knowledge. "It is said in the Vedas that a man experiences samādhi when his mind ascends to the seventh plane. The ego can disappear only when one goes into samādhi. Where does the mind of a man ordinarily dwell? In the first three planes. These are at the organs of evacuation and generation, and at the navel. Then the mind is immersed only in worldliness, attached to 'woman and gold'. A man sees the light of God when his mind dwells in the plane of the heart. He sees the light and exclaims: 'Ah! What is this? What is this?' The next plane is at the throat. When the mind dwells there he likes to hear and talk only of God. When the mind ascends to the next plane, in the forehead, between the eyebrows, he sees the form of Satchidānanda and desires to touch and embrace It. But he is unable to do so. It is like the light in a lantern, which you can see but cannot touch. You feel as if you were touching the light, but in reality you are not. When the mind reaches the seventh plane, then the ego vanishes completely and the man goes into samādhi." 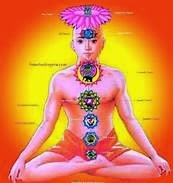 VIJAY: "What does a man see when he attains the Knowledge of Brahman after reaching the seventh plane?" MASTER: "What happens when the mind reaches the seventh plane cannot be described. "Once a boat enters the 'black waters' of the ocean, it does not return. Nobody knows what happens to the boat after that. Therefore the boat cannot give us any information about the ocean. "Once a salt doll went to measure the depth of the ocean. No sooner did it enter the water than it melted. Now who could tell how deep the ocean was? That which could have told about its depth had melted. Reaching the seventh plane, the mind is annihilated; man goes into samādhi. What he feels then cannot be described in words. "The 'I' that makes one a worldly person and attaches one to 'woman and gold' is the 'wicked I'. The intervention of this ego creates the difference between jiva and Ātman. Water appears to be divided into two parts if one puts a stick across it. But in reality there is only one water. It appears as two on account of the stick. This 'I' is the stick. Remove the stick and there remains only one water as before. "Now, what is this 'wicked I'? It is the ego that says: 'What? Don't they know me? I have so much money! Who is wealthier than I?' If a thief robs such a man of only ten rupees, first of all he wrings the money out of the thief, then he gives him a good beating. But the matter doesn't end there: the thief is handed over to the police and is eventually sent to jail. The 'wicked I' says: 'What? Doesn't the rogue know whom he has robbed? To steal my ten rupees! How dare he?' "
VIJAY: "If without destroying the 'I' a man cannot get rid of attachment to the world and consequently cannot experience samādhi, then it would be wise for him to follow the path of Brahmajnāna to attain samādhi. If the 'I' persists in the path of devotion, then one should rather choose the path of knowledge."